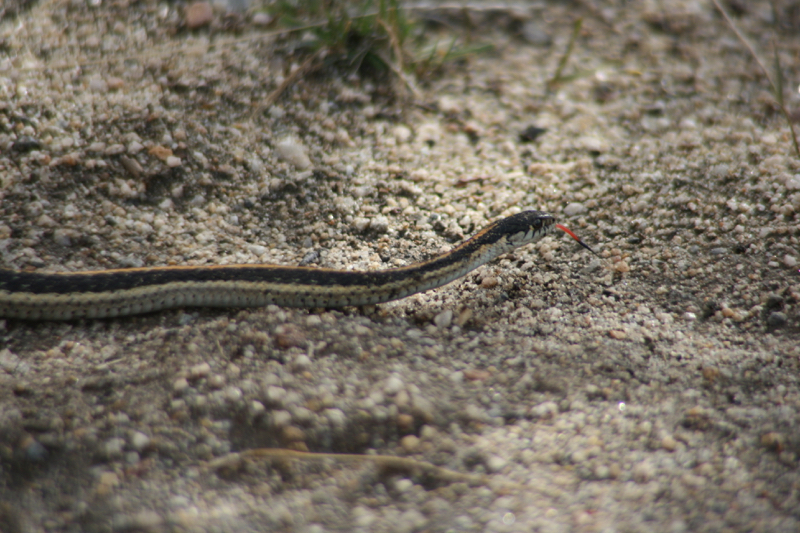 Western terrestrial garter snake (Thamnophis elegans), Dorostkar Park, Reno. Feb 2015. Photo: Kelsey McCutcheon. Well-defined yellow stripe down the center of back. May have flecks of red, checkers or stripes on sides. Up to 3.5 feet long. Western terrestrial garter snakes are often found near water bodies, and do sometimes enter the water. They feed on earthworms, fish, frogs, toads, lizards, other snakes, small mammals and sometimes birds (Stebbins 1966). A 1992 study on Truckee River amphibians and reptiles found Western terrestrial garter snakes living along the entire Truckee River, from Tahoe to Pyramid. They were the most abundant reptile found during this study, and were often found near the edge of the river in grassy areas beneath under mountain alders (Alnus tenufolia) or Pacific willow (Salix lasiandra). These snakes were observed in the river about 19% of the time, and were often observed swimming under rocks (Panik & Barrett 1994). Western terrestrial garter snakes are similar in appearance to Western aquatic garter snakes, but have a well-defined stripe down the center of their back (aquatic do not). Californiaherps.com has many photographs of each. Western terrestrial garter snake (Thamnophis elegans), Dorostokar Park, Reno. Feb 2015. Photo: Kelsey McCutcheon. Do you have information on Western terrestrial garter snakes, or original photographs taken locally? If so, please contribute photos and observations here, or email information to kelseymccutcheon@gmail.com. Thanks!